No, not the yellow one on Sesame Street! We like feeding the birds - but I must admit when I saw this one from my window I really hoped she did NOT try to land on the bird table! 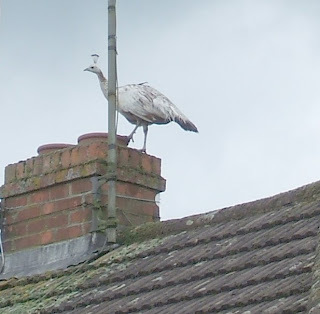 We've often heard peacocks in the area, and had previously seen a male displaying from a garage roof, but hadn't seen his albino wife before. Daft, but I hadn't realised they flew...though I suppose she could have climbed? And no...I am NOT going to knit one!